Situated in the heart of the beautiful Franschhoek valley, the Franschhoek Olive Oil Company produces award winning extra virgin olive oil. The Franschhoek Olive Oil company is based on Clermont, a historic wine and fruit farm. 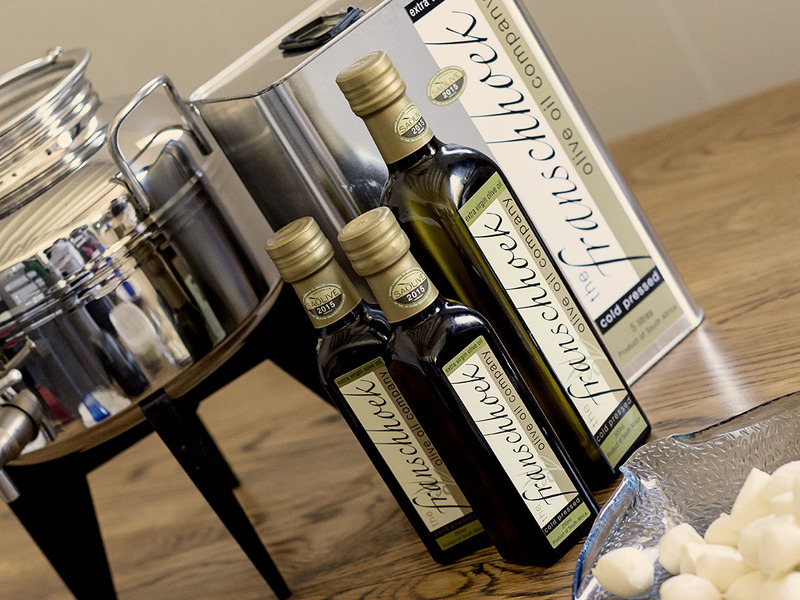 The extra virgin olive oils produced at the Franschhoek Olive Oil Company are from olives grown in the Franschhoek Valley, primarily from our own grove at Clermont. Just like different grape varieties used for wines, there are more than 1,000 olive varieties, each with its own unique taste characteristics but we focus on Italian varieties. Our olive grove contains mostly Frantoio with a few Leccino and Coratina trees representing the classic Tuscan varieties. The combination of these varieties is what gives our extra virgin olive oil its unique flavour. We choose to be a high quality artisanal producer of premium extra virgin olive oil. The direct involvement of our people from the orchard to the table ensures the provenance of our olive oils. Whether we are producing our own award winning oil, pressing olives for other growers in the community, we have a consistent passion about olive oil that promotes the growing of quality olives, the quality care and harvesting of the fruit, the processing, storing, and the eventual presentation and selling of this beautiful oil. Extra virgin olive oil is made simply by crushing olives and extracting the juice. It is the only cooking oil that is made without the use of chemicals and industrial refining. It’s simply the juice of fresh, healthy olives which contains the health-promoting nutrients that olive oil is famous for. One of the first questions people usually ask is what is the difference between Extra Virgin Olive Oil and other types of olive oils. It must be produced entirely by mechanical means without the use of any chemicals or additives, and at temperatures that will not degrade the oil. This is what the term “Cold-Pressed” or “Cold-Extracted” refers to. It’s not easy to produce extra virgin olive oil. A producer must use fresh olives in good condition and monitor every step of the process with great care. Extra virgin olive oil doesn’t stay that way forever. Even in perfect storage conditions, the oil will degrade over time, so it’s important to enjoy it within its two-year shelf life. Virgin Olive Oil is of a lesser quality than Extra Virgin. It is produced in much the same way. It is natural unrefined oil with a higher free acidity value than extra virgin but still below 2%. Virgin oils may have minimal defects. Refined or Pure Olive oil is refined (often using solvents or other industrial processes) olive oil that has been blended with a minimum amount of virgin oil. Refined olive oil is often sold as ‘Light’ or ‘Pure’ olive oil. Blended Olive Oil is usually a blend of refined olive oil and other oils – often canola or sunflower oils. These oils have little in common with extra virgin olive oil in terms of taste and antioxidant properties. Look for pleasant fruit flavors characteristic of fresh ripe or green olives. Ripe fruit yields oils that are milder, aromatic, buttery, and floral, while green fruit yields oils that are grassy, herbaceous, bitter, and pungent. Fruitiness also varies with the variety of olive. Fresh olives oil will have a mostly pleasant acrid flavor sensation on the tongue. If you pluck a perfect olive off a tree, it will be too bitter to eat. Just as with chocolate and craft beers, those who want to enjoy all of the health benefits and flavors of the best extra virgin olive oils should start to love bitterness. Often the opposite of bitterness is the taste of rancidity. Unfortunately, studies have shown people will often choose a rancid olive oil over a fresh, high-quality one, thanks to years of knowing little else. A peppery sensation in the mouth and throat is a sign of abundant nutrients in good, fresh extra virgin olive oil. Think of it like you would a chilli – the pungency is a positive characteristic of good olive oil. There are other characteristics that people may prefer but don’t relate to the quality of the oil, for example colour and clarity. Some prefer a green to a gold coloured oil and others like an oil that hasn’t been filtered so may appear cloudy. These are purely a matter of taste. As part of the SA Olive Commitment To Compliance process our oil is chemically analysed and tasted by an organoleptic tasting panel. 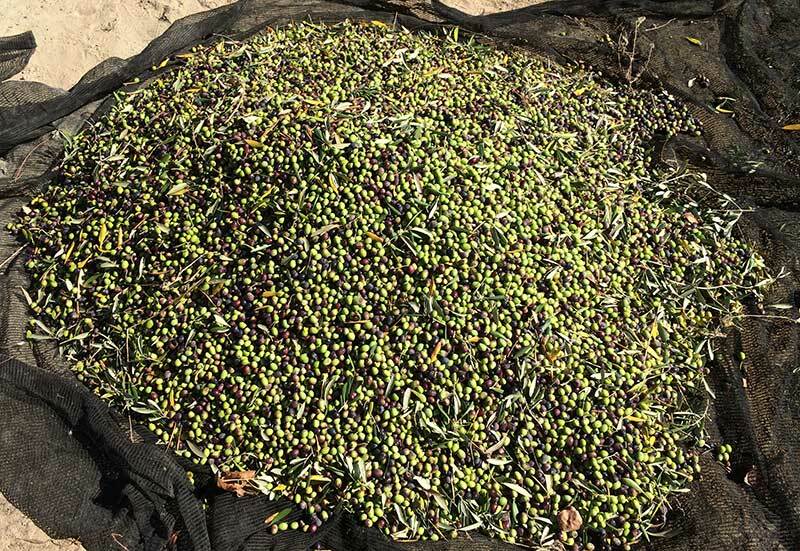 The analysis is done to ensure that the oil has been produced from good quality fresh olives and then processed and stored in hygienic conditions to maintain the freshness and antioxidants that are unique to Extra Virgin Olive Oil. Our oil is a medium intensity, with a good balance of fruitiness, bitterness and pepperiness that are characteristics of quality extra virgin olive oils. There are flavours of green and ripe olives, olive leaves as well as artichoke, walnuts and tomato flavours that give this oil its unique taste. The oil is superb with salads, for use in cooking or even on its own with crusty bread. Whatever you use it for, use it generously! The main enemies of keeping your olive oil fresh are heat, light and air. We bottle our extra virgin olive oils in a dark bottle to protect the oil from light but leaving it in a sunny spot in the kitchen isn’t a good idea. You can keep unopened olive oil in a cool, dark place for up to two years. However, once you open the container the oil begins to degrade much faster. A good rule of thumb is to use it within a few months after opening. Keep the bottle tightly capped and away from heat and direct light. 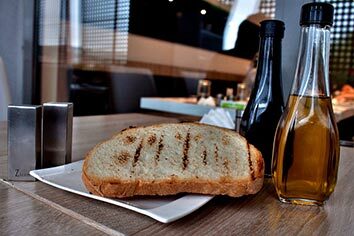 We believe that the best strategy is to use olive oil often, and go through it quickly. Only carefully selected, healthy olives, handpicked in their prime as they begin to ripen and milled without delay, are used to prepare our peppery and delicately fruity oil. Olives are rarely “pressed” these days. Modern machines us a centrifugal extraction process which is much more efficient and hygienic. However we still refer to pressing olives and olive presses out of habit or perhaps a longing for times gone by! The olives are processed as soon as they reach the olive shed using a state of the art Italian olive press. The olives are washed to remove any impurities picked up during the harvest and then crushed before being slowly mixed to help release the oil from the paste and then processed through a centrifuge decanter to separate the oil from the rest of the fruit. A strict process is adhered to that ensures our olive oil is truly extra virgin, with no additives and no second pressing – only a first cold extraction of the olives that ensures the very finest extra virgin olive oil. 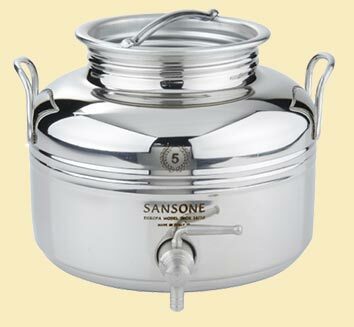 Once pressed the oil is stored under ideal conditions to maintain the freshness of the oil. We use a nitrogen blanketing system in our storage tanks to minimize the exposure of the olive oil to oxygen. The oil allowed to settle before filtering and bottling. The exception is our “Olio Nuovo” (or new oil) which is bottled directly from the first pressing of the season resulting in the freshest extra virgin olive oil. This unique pressing is only available in limited quantities and best consumed early to enjoy its unique flavour. 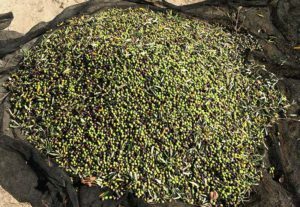 The olive pressing season varies from year to year but tends to run from March to June. If you are in Franschhoek enquire at reception to see how we produce extra virgin olive oil by coming and doing a tour of the mill. 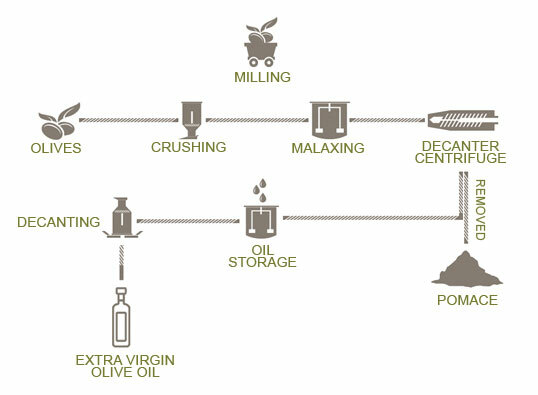 Producing Olive Oil with modern equipment is an energy-intensive process. 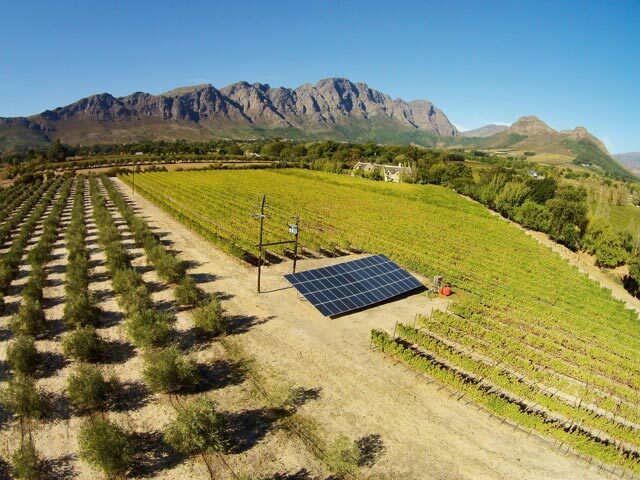 The machines use a lot of electricity and with this in mind the Franschhoek Olive Oil Company invested significantly in solar technology to power our mill and maintain our storage facilities. The system dedicated to the olive mill generates in excess of 12 Megawatts a year which is far more than needed to power the mill and the storage rooms. The excess power is used to further reduce the carbon footprint of the farm. The Franschhoek Olive Oil Company offers contract processing to other olive growers in Franschhoek during the season. This offers the grower a chance to produce their own olive oil without the expense of purchasing an olive press. Milling is offered by prior arrangement to ensure that the olives are pressed as soon as possible upon reaching the olive mill to ensure the best quality olive oil. All olives will be processed within 24 hours of arrival using our state of the art Italian olive press and following the same process we use to ensure the quality of the extra virgin olive oil. The olives are washed and then crushed before being slowly mixed to help release the oil from the paste and then processed through a decanter to extract the oil. A strict process is adhered to that ensures our olive oil is truly extra virgin, with no additives and no additional processing – only a first cold pressing of the olives that ensures the very finest extra virgin olive oil. The oil will be stored under ideal conditions and racked into storage tanks. Oil can be filtered if required at an additional cost. The olive oil will then be transferred into the customers’ containers. Containers are to be supplied by the customer when delivering the olives or we can provide containers if required. We also offer a bottling service and can deliver the oil in 500ml olive oil bottles. Please contact us to find out more information regarding this service including availability and pricing. The health benefits of olive oil are unrivaled, and research reveals more benefits nearly every day. We are only just beginning to understand the countless ways olive oil can improve our health and our lives. 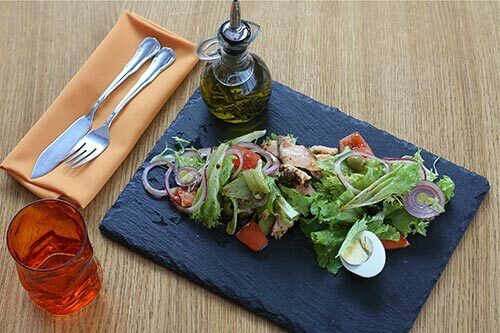 Olive oil is the cornerstone of the Mediterranean diet. Fats are one of the macronutrients essential to human life and make up a large part of our bodies. We wouldn’t be able to absorb many vitamins without fat in our diets. Healthy fats, such as extra virgin olive oil, can even help you fight stress, improve mood swings, decrease mental fatigue and can actually help you manage your weight. While fat in general gets a bad reputation, not all fats are bad, you just have to make the right choices! Without wanting to try and claim that extra virgin olive oil cures all ills, we will say that is good for you and is always a good choice! The Franschhoek Olive Oil Company is based on Clermont, a historic wine and fruit farm in the Franschhoek valley. Surrounded by magnificent mountains and only a few minutes from the centre of the quaint village. The stylish country guesthouse of Auberge Clermont offers luxurious accommodation as well as peace and seclusion for the discerning traveller. This Four Star Bed & Breakfast has six luxurious en-suite rooms, including a romantic honeymoon suite. The suites are individually decorated in the colours and moods of Provence. Underfloor heating, air-conditioning and ceiling fans ensure year round comfort. Auberge Clermont also offers a self-catering Villa, relaxing country lodgings at its best. The villa is perfect for a family or group of friends. Step back in time and indulge in its Cape farmhouse charm. Clermont offers guests the chance to stay close to the centre of Franschhoek yet still experience life on a working farm and vineyard.